Here is a self-reflective biographical introduction a friend of mine wrote that was published in the Vancouver TM for Women Centre Newsletter in Vancouver, BC, Canada. Each issue they introduce someone to the meditating community. Artist, writer and photographer Betsy Randel was featured in their May 2017 issue. Centre Director Deboragh Varnel said Betsy’s testimonial was really deep and authentic. I agree, which is why I reproduced it here with the accompanying photographs. I was born in California to a middle class family but even as a child always found myself at odds with the interactions of people around me—the seeming superficiality of their concerns and lives. I found peace and solace in the beauty of nature—the skies, clouds, flowers and trees. I left my family home to marry at the young age of 18 and by 20 found myself divorced, feeling adrift in my life. In the college I was halfheartedly attending, one teacher stood out for me and we became friends. She suggested I start meditating with TM, which is what she had been practicing. I had never heard of it but found myself in the heart of L.A. being instructed in the practice in 1970 when I was 21. I felt my life start to make sense for the first time from my first deep dive into consciousness through TM. One month after being initiated, I was again guided by my friend to attend a one-month course with Maharishi Mahesh Yogi at Humboldt State College in California. There I experienced wisdom and great peace spoken of by Maharishi being lived by the many practitioners of all ages there. I was very moved to see and feel the harmony with many meditating together. I became a teacher of TM in 1973 and continued my path of learning and experiencing more through advanced courses and attending MUM (Maharishi University of Management) in Iowa where I met my husband, a Canadian teacher of TM. I went on to raise two children and to complete my Certificate in Fine Arts at Emily Carr University in Vancouver, B.C. What I really want to let people know is that although the surface of my life hasn’t always been easy or smooth, having that underlying peace of twice a day meditation has kept me healthy and at peace through even the roughest times. I have been meditating now for 47 years and I am so grateful for it and to Maharishi who made great efforts to bring this knowledge to the western world where the outer values are so strong and so focused on, but the inner value of life is mostly lost. As one ages, if one’s attention is focused only on the outer body and life changes, one can feel regretful and despairing. But if one has this technique that works like no other, to experience the deep peace within and eternal non-changing level of life, one feels safe with outer changes and more resilient. One also stays healthier and happier. It is such a gift. The greatest gift one can give to oneself. Betsy Randel is an artist and writer living in Vancouver, BC, Canada. Visit her website to see more of her beautiful artwork www.artthatheals.org. Personal note: This is a longer version. When Betsy attended MUM it was known as MIU, Maharishi International University. See www.mum.edu. Also see Cliffhouse and Arbutus blossoms inspire haiku by Ken Chawkin and paintings by Betsy Randel. “Magic Light” by Bill Graeser won the Iowa Poetry Association’s 2012 Norman Thomas Memorial Award. Bill posted it August 28, 2012. Congratulations, Bill, you deserve this memorial award for a memorial poem of the great Ansel Adams. I’m sure he’d approve, and be pleased! Visit http://www.anseladams.com for more amazing photos. Another great poem by Bill Graeser is What You May Not Know About Frankenstein. I posted it as At last—the truth about Frankenstein. Visit his website for more fine poetry and photographs: http://billgraeser.wordpress.com. Found this detailed interview with Marc Silber and Michael Adams: An Inside Look at Ansel Adams’ Photography In Yosemite, posted April 10, 2013. I also found this earlier fascinating video posted by Silber Studios on May 7, 2011 on How Ansel Adams Photographed His Iconic “Moonrise Hernandez”. Marc is given a tour of the house and darkroom by Ansel’s son, Michael Adams. He was seven years old and with his father when he took the iconic picture of the moonrise over Hernandez and described how he created it. The music was composed by Andrew Buffett, the American musician, composer, author and philanthropist. Peter is an Emmy Award winner, New York Times best-selling author and co-chair of the NoVo Foundation. He is the youngest son of billionaire investor Warren Buffett. Here is an earlier video posted by Marc Silber about advice on how to visualize your photos, from a rare interview with Ansel Adams: Photography Visualization Advice by Ansel Adams. Photo visualization was so important to Ansel Adams that he made it the first chapter of his book on photography. 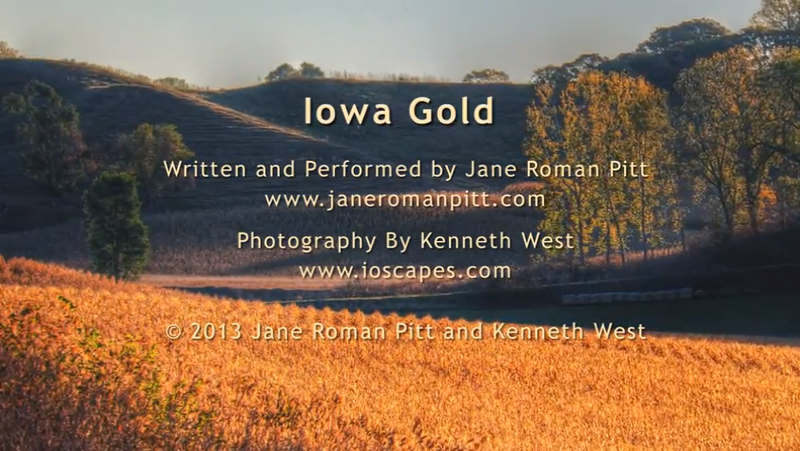 Composer and singer/songwriter Jane Roman Pitt and Iowa landscape photographer Ken West, both of Fairfield, officially presented the music video “Iowa Gold” to Gov. Terry Branstad Wednesday afternoon in the State Capitol Building in Des Moines. Earlier Wednesday, Pitt and West were interviewed by Charity Nebbe on Iowa Public Radio’s Talk of Iowa. The interview can be heard at http://iowapublicradio.org/post/iowa-gold-and-wisconsin-heroes. A tribute to the richness of Iowa’s farm culture, people and rural landscapes, “Iowa Gold” was produced solely for noncommercial use to promote the beauty of Iowa and the state’s scenic byways. Barbara Sletto, director of the Heartland Youth Choir, which was scheduled to perform “Iowa Gold” 2-3 p.m. today on the Budweiser Stage at the Iowa State Fair, praised the song. “The words are great and the melody is very singable — the song is great,” she said. West described “Iowa Gold” as a song Iowa school children or anyone can relate to with contemporary lyrics easy to sing. “We hope our video inspires the next generation to appreciate and care for the land they are inheriting,” West said. Pitt is a recording artist, songwriter, and composer. She is winner of the grand prize at the International Amadeus Choral Competition and her “Midnight Lullaby” CD received a “Parents’ Choice Award,” an award that honors the best material in children’s media. West’s images have been featured on Iowa Public Television’s “Iowa Outdoors” and at the National Center for Nature Photography, which is America’s first and only center devoted exclusively to nature photography. More information on both artists can be found on the Iowa Gold website at www.iowagoldsong.com. Related news: Fairfield Artists and Musicians Share in Iowa Gold for more information and other news coverage. Laura Simon reports collaboration of composer and landscape photographer to showcase Iowa.